CARMEL, Ind. — FERC on Friday granted MISO permission to implement the remaining two proposals in its three-part short-term resource availability and need project. Facing baseload generation retirements, more frequent emergencies and diminishing capacity margins, MISO had proposed stricter outage scheduling rules and annual real power testing for demand response. FERC said MISO could implement both provisions, though it wants the RTO’s Maintenance Margin tool chronicled in its Tariff. Taken together, the three filings are geared toward freeing up an additional 10 GW of supply as MISO navigates its spring maintenance outage season and the arrival of warm weather. 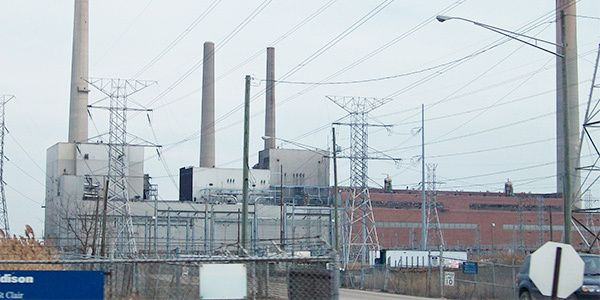 DTE Energy’s St. Clair Power Plant is among coal plants that could close earlier than expected, exacerbating baseload generation retirements in MISO. MISO can now impose new generator accreditation penalties for planned outages taken during what it deems “low margin, high risk periods” (ER19-915). RTO staff have said the rules will incent the forward scheduling of planned generation outages. FERC approved the proposal effective Monday and said it expected the rules will promote advanced scheduling, improve outage coordination and help MISO address its recent spate of shoulder period emergencies. “MISO’s proposed Tariff revisions add specificity and incentives to the Tariff’s existing provisions governing the scheduling of generator planned outages,” FERC said. MISO generation resources now must provide 120 days’ notice for planned outages. However, outages scheduled between 14 and 119 days in advance will be exempt from the RTO’s accreditation penalties, provided the outages are scheduled during predefined periods with adequate margins. Generator planned outages and derates scheduled fewer than 14 days in advance and occurring during a declared maximum generation emergency would be subject to accreditation penalties. The proposal also provides safe harbor provisions for resources that adjust a planned outage at MISO’s request. The RTO also has instituted a transition period to the new set of outage rules. Outages scheduled prior to April 1 will not be subject to the accreditation penalty, while requests and revisions submitted April 1 and beyond for outages starting April 15 through July 29 would be exempt from the penalty if the request is submitted no later than 14 days in advance and MISO foresees “adequate projected margin at the time of the request.” The full set of outage requirements will go into effect for outages scheduled to start July 30 or later. MISO said that although it has so far managed generation outages through voluntary rescheduling, “there has been a significant increase in the number of maximum generation emergencies that are at least in part driven by highly correlated generator planned outages.” The RTO said only 30% of planned outages are scheduled 120 days or more in advance, with most being scheduled just weeks in advance. A group of state regulators and Prairie Power argued that MISO wasn’t providing enough detail into what load forecasts it uses in its Maintenance Margin tool, the nonpublic webpage the RTO maintains to help members schedule outages during adequate supply conditions. But FERC said the tiered approach “provides MISO with the forward transparency it seeks, reduces the risks associated with correlated [outages] and maintains sufficient flexibility for generator owners to schedule their [outages] without risk of an accreditation penalty.” FERC also pointed out that outages scheduled fewer than two weeks in advance aren’t automatically subject to an accreditation penalty unless the outage occurs during an emergency. However, FERC agreed with WEC Utilities and American Municipal Power that MISO needs to define the Maintenance Margin in its Tariff. The tool “is the sole factor in determining whether there is an ‘adequate projected margin’ under the proposed Tariff revisions,” FERC said, and as such, should be recorded in the MISO Tariff. “We find that the Maintenance Margin can have a significant impact on rates, terms and conditions of service,” the commission said, directing MISO to make a compliance filing by the end of April. FERC on Friday also approved MISO’s proposal to require annual actual power tests from its DR resources (ER19-651). The RTO had asked for permission to conduct the tests to get more certainty about resources’ ability to perform when needed during tight operating conditions. At MISO’s recent Board of Directors week in New Orleans, RTO executives said the move will put DR on a more level playing field with other resources, which are already beholden to the annual power tests. DR resources that complete the annual testing will receive credit for one of the five deployments required of them in a planning year. MISO has said that resources that are deployed and follow all scheduling instructions in a planning year will not be subject to the testing in the following year. MISO has also said it will waive the testing requirements for DR resources “that are subject to regulatory restrictions that preclude testing.” Additionally, a DR resource that simply wants to opt out of testing can do so, provided it agrees to pay MISO three times the cost of demand reduction for non- or underperformance. Some MISO member companies protested the filing, arguing that the RTO failed to justify the need for annual testing; the testing would cause DR to exit the market; the proposed penalty cost was arbitrarily punitive; and an annual testing requirement would result in increased production costs and risk to equipment. But FERC disagreed on all fronts. “To the extent that MISO’s proposal increases costs on demand resource owners, they can reflect those costs in their submitted offers into the auction,” FERC said. Members agreed to develop rules for demand response providers requesting maintenance outages.